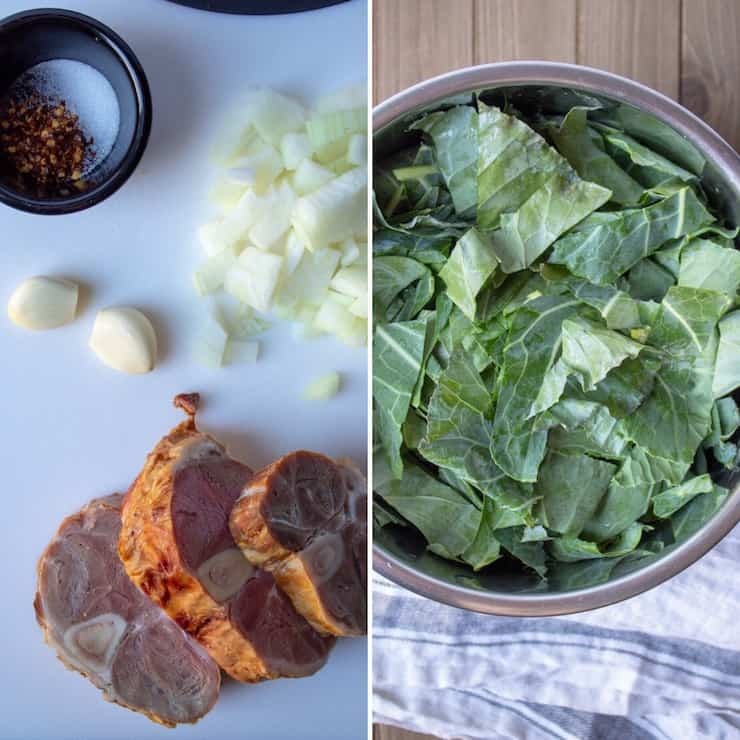 Instant Pot Collard Greens, easy southern/soul food style collards in under an hour, with smoky ham and seasoned pot liquor for sopping up with corn bread, of course! 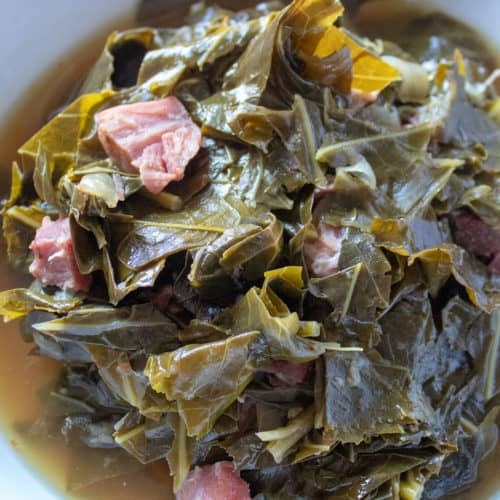 When I think of collard greens, I think of the times I’ve had them as one of the quintessential sides in a soul food restaurant. I never had them growing up in Chicago, my parents never made collards. But here in St. Louis, southern style food is pretty prevalent. And with my Instant Pot, I decided it was time to try making collards at home. 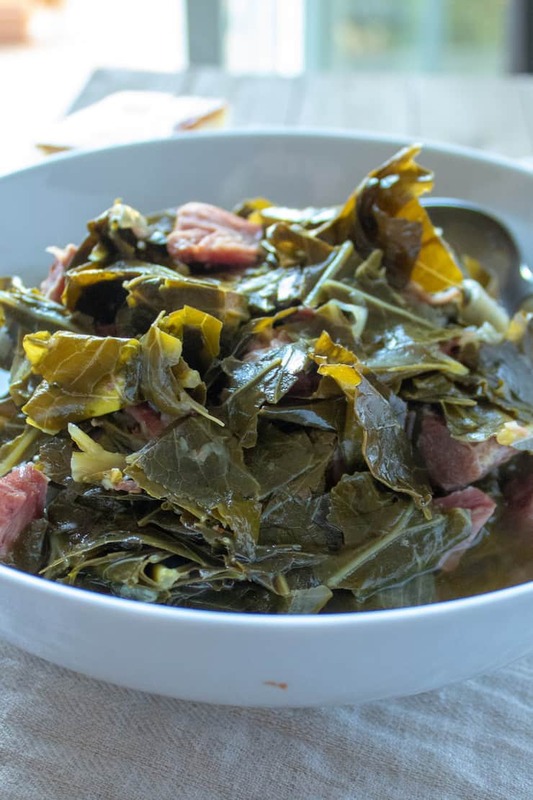 Collard greens are typically simmered for a long time on the stove with seasonings and smoky ham, or even a smoked turkey leg. The greens become tender and the cooking liquid is a magical elixir. Pressure cooking greatly reduces the time it takes for this slow cooked goodness, and I’m always looking for new things to make in my Instant Pot. After cleaning and chopping the collards, probably the hardest part (you could get away with bagged chopped collards if you wanted), it goes in the Instant Pot with some stock, onions, garlic and seasonings and the pressure cooker does all the work in 30 minutes. Pretty cool. I used homemade turkey stock, but I’m guessing you won’t have that on hand, chicken stock is totally fine. 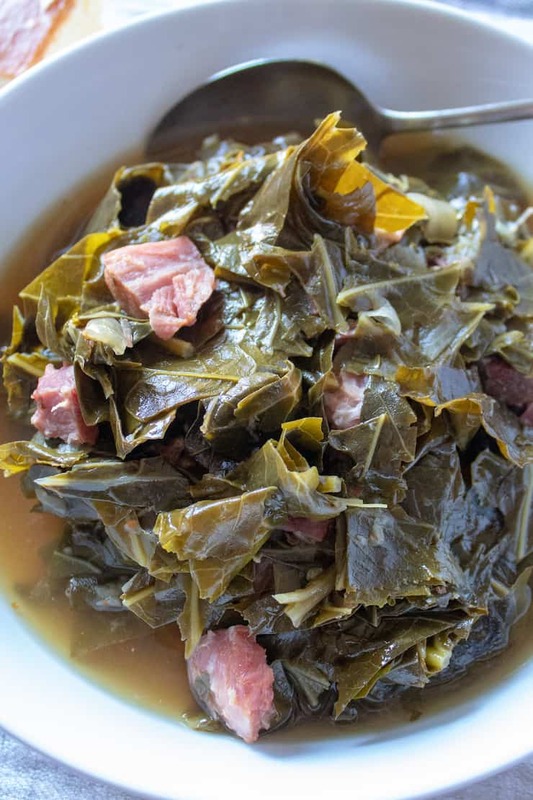 What is the pot liquor after cooking collard greens? After cooking collards, or other greens, the liquid left behind is often referred to as pot liquor, or pot likker, or even collard liquor. 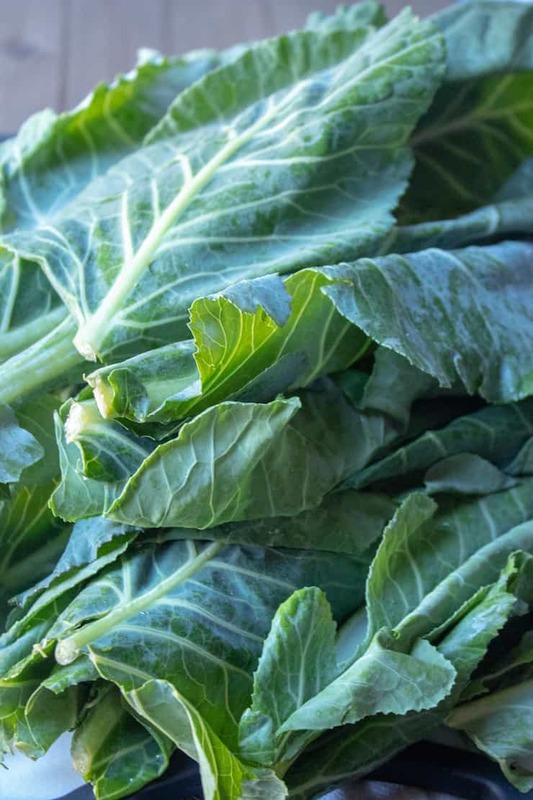 It’s very nutritious and loaded with vitamins and minerals, lots of vitamin K. The liquor is great for using in soups and gravies, but most often this seasoned likker is for sopping up with cornbread. That’s my favorite part, I think. It’s just so good, I could drink the stuff. If you like southern style collard greens, I think you’ll also want to try this other Instant Pot recipe of mine, Country Green Beans, Potatoes and Ham. More tasty pot likker here, too! If you try these Instant Pot Collard Greens, please rate it below in the comments and let me know how it went ~ I love hearing from you! HUNGRY FOR MORE? Subscribe to my Newsletter and come hang out with me on PINTEREST, INSTAGRAM and FACEBOOK for all the latest updates. 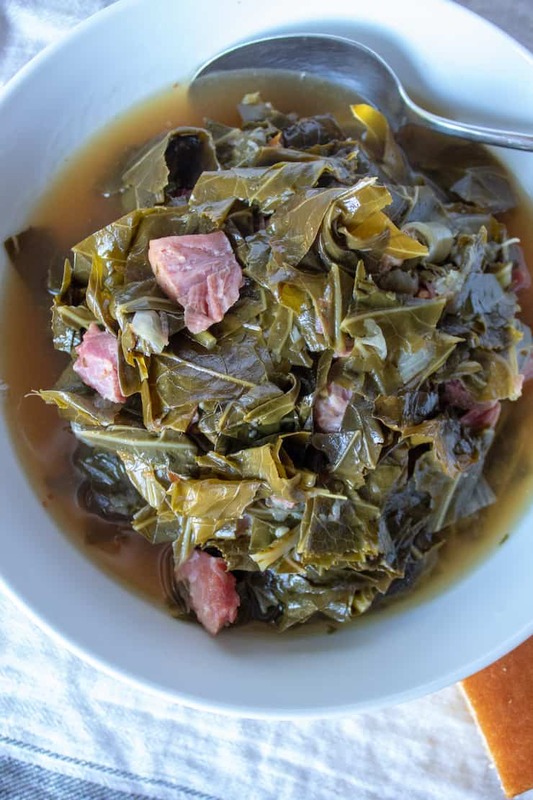 Instant Pot collard greens, easy southern style collards in under an hour, with smoky ham and tasty pot liquor to soak up with cornbread! Heat olive oil on sauté setting. When hot, add chopped onion. Cook for a few minutes to soften then add garlic, cook for 30 seconds more. Turn off sauté function. Add the stock, apple cider vinegar, sugar and crushed red pepper; stir to combine. Season with a little salt and pepper. Lay in the ham shanks and cover the top with chopped collard greens. Push down the collards to submerge, be careful to stay below the fill line. Seal pressure cooker and set timer for 30 minutes on high pressure. When finished, let pot naturally release for 15 minutes. Release any remaining pressure and open, remove ham shanks and bones to board. Cut meat into bite size pieces and return to pot. Put in serving bowl with cooking liquid and serve. Don't forget the cornbread! I like to use ham shanks and that's what I recommend. Ham hocks add a lot of flavor but yield very little meat. Use ham shanks here. I use a 6-quart Instant Pot for this recipe (and all my Instant Pot recipes). 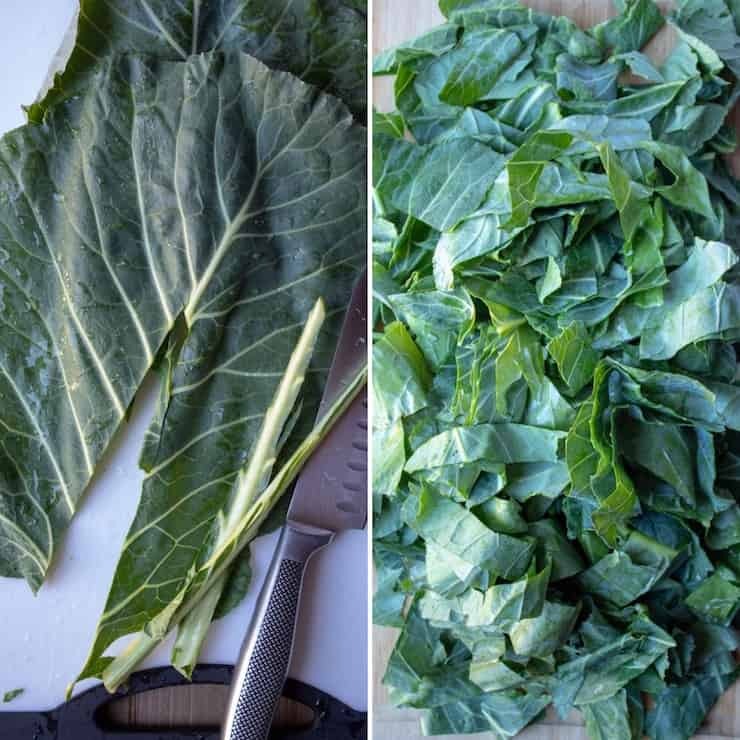 You could use pre-packaged chopped collard greens, if you like. I believe they come in 16-ounce bags. I definitely recommend serving with cornbread to sop up the pot liquor. If desired, serve the cooking liquid on the side in little individual bowls. Soul food that’s good for your tummy.